I know, I know, my updates are not very frequent these days. So here is hoping to catch up a bit. First, with a recap of our Europe trip over Christmas, which was really great. By now Daniel is used to traveling, changing environment and language, and he knows the entire family pretty well. He had a blast! I was a little bit more concerned about Charlotte, since she had been somewhat difficult during our summer trip (although I realize I didn't write about it much) and our Europe trip with Daniel at the same age had had its tough moments as well (although I only mention the issues at the end!) As a side note, it looks like I might mentally be denying the bad memories since I barely write about them! Back to this last trip, Charlotte actually did great. She got oriented right away, enjoyed the many activities that had been planned and played entertainer for the family. She still doesn't say much, but her laugh and good mood is contagious. And yes, this time this is really what happened. I am not ignoring bad memories. 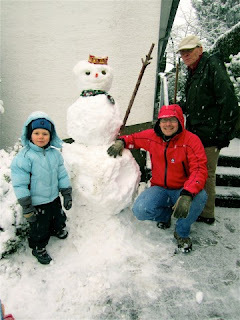 In Germany, we were lucky enough to get snow on our first morning home... and thankfully the kids barely had jet lag this time around, so we were up and outside to enjoy the few hours of snow. Daniel in particular had the greatest time. 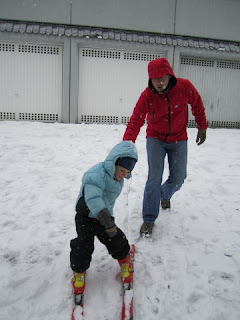 He tried skiing in the little alley by the house and thought it was the best thing ever! 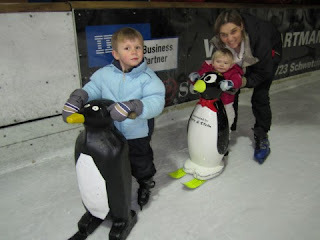 We also tried ice skating, which turned out to be quite difficult for both kids, but still was a lot of fun. We also (re)discovered the "Bergbahn" and the Christmas market (which was mostly about the carousel for the kids), and discovered a great indoor pool with slides and lagoons. It felt like paradise! In France, we also enjoyed the Christmas festivities in my parents' town, which included reindeers, Christmas fireworks and a tiny but cute Christmas market. 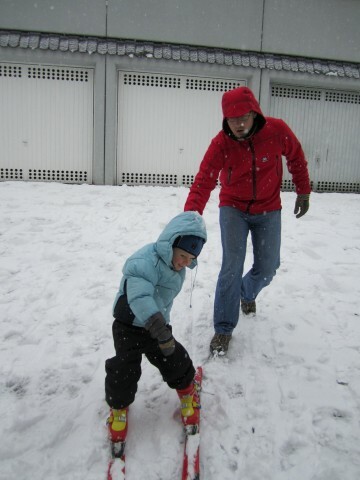 Overall, we didn't get great weather, so had to manage with indoor activities. But between playing with all the toys they had gotten for Christmas, meeting the cousins and some indoor activities, the kids had a lot of fun. The only drawback from not seeing the sun in 2.5 weeks is that we all got sick one way or the other. Charlotte even got an ear infection right on the way back from Europe (poor little thing was so unhappy when we were landing). This was a blow in the vacation where we were expecting to rest and enjoy family. But the nice weather in California soon made up for it, and now we just have the good memories. And next year, we might try to celebrate our winter break somewhere in the sun!